Idk if anyone else posted this but I apologize if that's the case. This one makes me more sad than any of the other celebrity deaths this year. We still have a few days left. Let's hope 2016 can be merciful. RIP Carrie. Thanks for all the memories. I just went to see the new movie yesterday with her CG younger self at the end, asking my dad if she'd be in newer movies still because of her heart attack. Sad sad day. Rest in peace. This is surreal news to wake up to after seeing Rogue One last night. Carrie Fisher was a badass and I feel so badly for her mother. Her future in Star Wars is pretty much assured after what I've seen in Rogue One. Years of cocaine caused an incredible amount of permanent damage. It's unfortunate, but fixing your habits later won't entirely repair the harm done by earlier drug habits to your body. It's never worth taking the true happiness of tomorrow and turning it into the false happiness of today. It's sad, but then again it was logical she wasn't going to get that old. Gone way too soon. She will always be our princess. Apparently she finished filming all her scenes for Ep. VIII back in July. All the more reason to look forward to it, even if it is the last time we'll see her. Princess Leia was a character filled with fun, development, and heartbreaking moments. Her relationship with Hans was widely regarded as one of the best film romances, and her character was considered to be the best film princesses, if not one of the best fictional princesses of all time. But Fisher's performance made the character, because a good actor would make a character so believable. It's sad to see her end like this. I really hope she won't be replaced in 8. Rest in peace. A very sad day to both Star Wars and the Entertainment industry. She will be missed. This is a tough one to swallow. Carrie Fisher overcame addiction and mental illness, and was a phenomenal writer and an iconic actress. I'm projecting my no onto this! 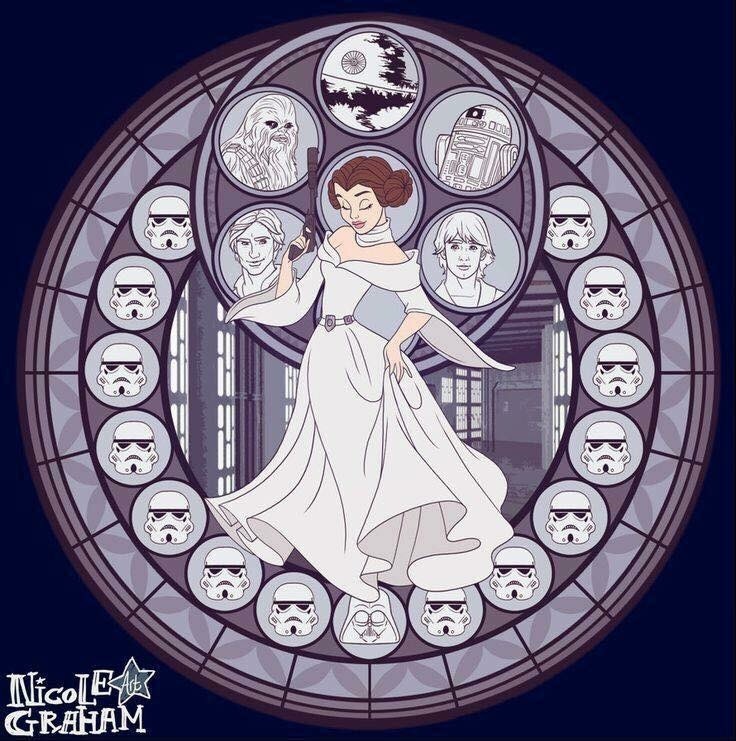 Farewell to an honorary Disney Princess, RIP. The lack of C3PO actually made this piece really funny to me.